Place cabbage in a greased 2-qt. casserole; set aside. In a saucepan, heat oil over medium. Stir in flour, salt and pepper; cook until bubbly. gradually stir in milk; cook and stir until thickened. Fold in cheese. Pour over cabbage. 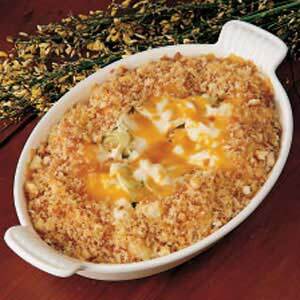 Combine bread crumbs and butter; sprinkle on top. Bake, uncovered, at 350° for 20-30 minutes or until bubbly. Serve immediately.